On Friday 18th November Holsworthy Community College students spent the day in non-uniform in aid of Children in Need. Many students also took part in sponsored events up to and including the day. By far the most popular was a sponsored silence, but other events included a sponsored walk by Ryan, who has over £100 pledged, Freya Laming cycled 12 miles and raised £27.40, Zoe Whinnerah read 12 books over a week and took Accelerated Reader quizzes on them all and raised a fantastic £51.58 and Eden Frost spent the day singing instead of speaking, which was very entertaining! The Art Club ran a raffle to win a cake and sold over 100 tickets. The cake, made by Heidi and Abigail Thompson (with a bit of help from their mum) was amazing and must have taken a lot of hard work. Heidi and Abigail both purchased raffle tickets and the winning ticket turned out to belong to Heidi! She had already said that if she won the cake she would donate it to the HCC staff—what a superstar! Abigail, Heidi and Georgia took their wonderful cake down to the staff room and the staff were amazed and very proud of these wonderful students. A staff sweepstake of guess the number of spots on a cake from the BBC website was subscribed to by 20 staff. Miss Dance had the closest guess—only 2 out! She very kindly donated her £20 winnings to the charity. Some teachers took part in the BBC Mannequin Challenge, where they stood absolutely still in a pose for around 2 minutes. This was done at lunchtime, much to the amusement of the students. The College also sold Pudsey keyrings, Pudsey ears and festival wristbands to staff and students. Other events included a line of 2 pence pieces around the hall. This was well supported, with the line reaching a staggering 111 feet, which raised £25.38—that means we collected 1,269 two pence pieces! So far we have raised an astounding £807.27! 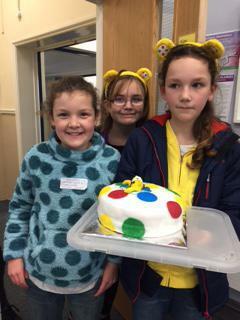 If students still have sponsor money to hand in please do so urgently, so we can get it sent off to Children in Need. A huge thank you to you all for supporting this national charity event.